"An innovative PPP solution to providing healthcare services in Namibia"
Namibia’s large landmass, difficult terrain, and sparse population make accessing basic healthcare services a challenge for many Namibians. With five trucks that have been converted to mobile clinics, Mister Sister visits remote and underserved areas to provide primary healthcare services to over 15,000 registered patients. Ingrid de Beer, general manager of PharmAccess Namibia, said “This model allows us to provide quality services across the board. Whether in the shanty towns or at private companies, all our patients receive the same quality care. They’re treated by the same nurses and they get the same medicines.” The mobile clinics are part of the quality improvement program SafeCare, which stimulates constant monitoring and improvement on the quality of their services. Since private companies pay for Mister Sister to visit their premises, employees are healthier and no longer need to take off time from work to visit a faraway clinic. 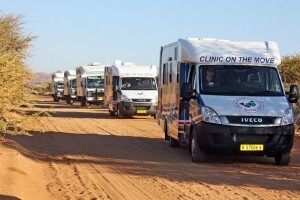 Complementary to the government outreach programs, which tend to be disease-specific, the mobile clinics provide integrated services. This includes HIV/AIDS testing and treatment, TB sputum collection, family planning, pap smears, and antenatal as well as postnatal care. In case of chronic conditions or other ailments that require seeing a doctor, Mister Sister has a referral agreement with the Ministry of Health. “Mister Sister lightens the burden on public sector facilities as we filter out people who can be treated by our nurses,” de Beer explained.